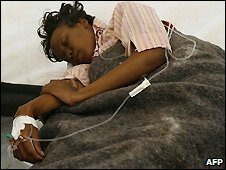 Just last week, the government of Zimbabwe said at one point that its cholera epidemic was caused by the West and then said there was no more cholera in Zimbabwe. Now we learn that the epidemic is growing…. The United Nations says 978 people have now been killed by the cholera outbreak in Zimbabwe, an increase of 25% from the last figure given three days ago. The UN’s office for humanitarian affairs says 18,413 suspected cases have been reported across the country since the outbreak began in August. The disease has spread quickly as the health care and water systems have collapsed amid a long political crisis. 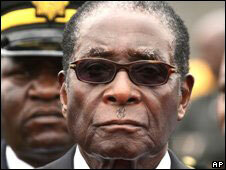 Last week, President Robert Mugabe said the spread of cholera had been halted. The UN’s Office for the Co-ordination of Humanitarian Affairs (OCHA) said the worst-hit area was the capital, Harare, with 208 confirmed deaths and 8,454 suspected cases. The South African Red Cross has sent much-needed medical supplies to Zimbabwe, and has issued an appeal for funds to treat a total of 30,000 people. The UN has said it estimates up to 60,000 people may eventually be affected. You are currently browsing the archives for the epidemic category.